Speaking to Metro newspaper, Transformers Live Action Movie Series producer Loranzo di Bonaventura admits that an animated movie set in Cybertron is currently in the works. 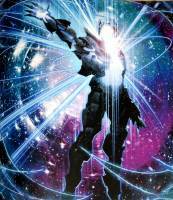 “We actually have an animated movie in the works that will tell the whole Cybertron mythology. The fans will love that.” di Bonaventura teases. Speaking about the possible Optimus Prime solo movie, the producer is not so enthusiastic. An animated movie set in Bayverse is rumored for a long time. It was even rumored to be under development by Hasbro’s in-house animation studio Boulder Media Limited. However, plans may have been changed since then, for Boulder is hiring many artists who are specialized in drawing animals, especially ponies, for a CGI Feature Film; the first ever for the company. Andrew Barrer & Gabriel Ferrari submitted the screenplay for the new movie during their stay at the [now disbanded] Transformers Cinematic Universe Writers’ Room. It is likely that this Transformers Animated Movie is kept under wraps at Paramount Animations; a sub-division of Paramount Pictures. Lorenzo, Lorenzo, Lorenzo…didn't you do this before? Announcing the Bumblebee movie before TLK really was 'out' per se? Optimus Prime is stoic and has few words to say….dafuq? Ever heard of Orion Pax, ever heard of Elita 1 ? You can write plenty from that alone…..
Megatron is a grassroots hero, having been a miner, a gladiator, a philosopher, and finally a candidate to bear the matrix and become a Prime. …and leader of growing party that wishes to change the current slow government and force change. I'm not sure why so many people are talking like the Optimus movie is going to be about his origin. If the movie covers it, it will likely be in brief flashbacks, similar to the Cybertron scenes in Bumblebee. It's more likely that the Optimus movie will take place on Earth after the Bumblebee movie (it could even be in modern times). A movie all about Optimus' origins would have to be fully/mostly animated, which isn't the case. The Optimus movie is live-action, the Cybertron prequel is animated. Lorenzo says a lot of goofy stuff, but he's right on the money with his statement about Optimus being a tricky character to make a movie about. Note that he's not saying it's impossible, just trickier. Optimus has less character flaws than someone like Bumblebee, and is less relatable to the average person. Again, he's not talking about Orion Pax, he's talking about Optimus Prime as most people know him. If you liked the Captain America origin, which was well recieved, Optimus has a similar origin. Megatron was like Pax's big brother who became evil, while Pax transcends his meekness to face his own friend in battle. Michael Shannon channels early Megatron with his Zod. Anyway a well done 3 Dimensional Megatron would really seal the deal. Good idea! However, I think a Prime movie should be like the Autocracy comics by IDW. Hey guys, I’m new here, BIG fan of TF, and I would love to share my thoughts on this! First of all, I’m a middle school kid and even I hated the Bay films, and the news of a Cybertron movie REALLY excites me. Second, Lorenzo, have you not heard of Optimus’ origin? If the CGI looked really good, and the story is good, I would welcome a TF prequel telling the tale of how the war began. They could create a story that feels like a Greek tragedy or a Shakespearean play. I want it to touch on how good intentions can turn evil, how good people turn bad, and ordinary people rise up to do good. Simple answer to optimus prime movie.